Bre is using Smore newsletters to spread the word online. The uniform initially varied greatly due to a variety of reasons such as location, limitations on the supply of cloth and other materials, state regulations that were different from the standard regulations and the cost of materials during the war. 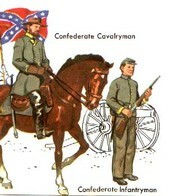 Confederate soldiers wore gray kepi's, a jacket and trousers. These were weathered and faded, and took on a light brownish look, that gave them the name of "butternuts". The southern cotton fields allowed for cotton cloth uniforms. 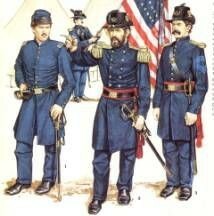 Texas units had access to massive stocks of Federal blue uniforms, which were acquired after confederate forces captured a Federal supply depot in San Antonio, these were worn as late as 1863. 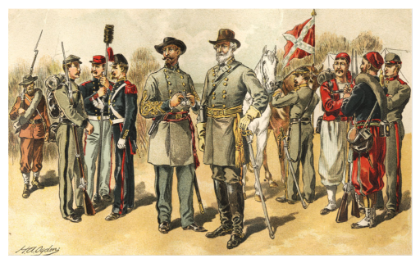 Early on, servicemen sometimes wore combinations of uniform pieces, making due with what they could get from captured Union Soldiers, or from Union dead, or even civilian clothing. 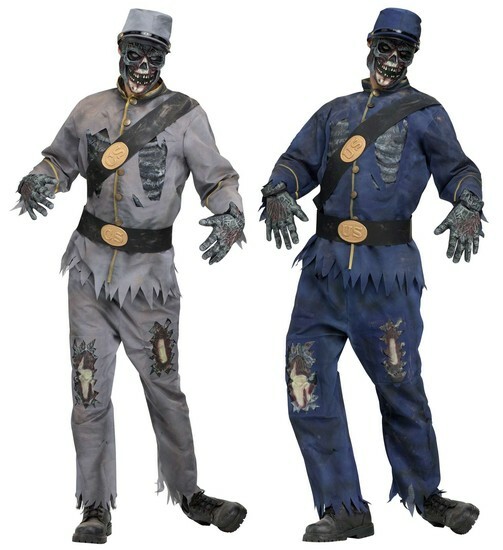 Regular Union troops wore the traditional dark blue trousers, jackets and kepi pants. Volunteers were given to wear dark blue jackets, and kepis; but with light blue trousers. The North's troops wore wool, which was warm in winter and cool in summer. Buttons featured the US Eagle which originally showed on the eagles' shields, letters denoting the soldiers branch of service. I for Infantry, C or D for Calvary, A for Artillery, some earlier uniforms used R for Rifleman and V for Voltigeur. For special units, there were different Uniforms. 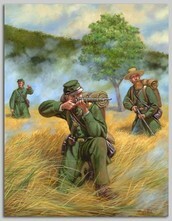 The most famous were the green uniforms of Hiram Berdan's Union sharpshooters. But, the blue and gray predominated. A rifle green coat was issued to Berdan's first and second sharpshooter regiment as an early camouflage. These had black rubber buttons that would not reflect the light and give away the snipers position.